This morning the signs of another sunny day was in the making so at 8am we got underway full of anticipation that today we would definately do the aqueducts. Shortly after setting off Chris spotted this loan sheep on the offside clearly content with its location. Just past the cottage we spotted its kennel. Clearly this was the owners pet of sorts and a sign on the pen stated "Do not feed me as I will bite" We nicknamed the sheep Shaun and waited for Gromit to appear, alass he did not. A little later on we came across Lion Quays hotel and restaurant. Only one boat was on the moorings which looked inviting. We resolved to stop here on our return to sample the delights of the restaurant. 30 minutes later we arrived at Chirk aqueduct. We had a couple of minutes wait for two boats to cross then we proceeded onto the aqueduct following a Viking boats hire boat. Waiting our turn to cross. After the aqueduct the next installment is the Chirk tunnel. With our Viking boat ahead doing a great path finding job we could relax and follow him into the tunnel. At 459 yards the tunnel is quite narrow. Mr Viking was giving his engine quite a work out to get through. This made our passage tricky as the flow of water through the tunnel was disturbed by his wash. Had he throttled back he would have made much better progress. 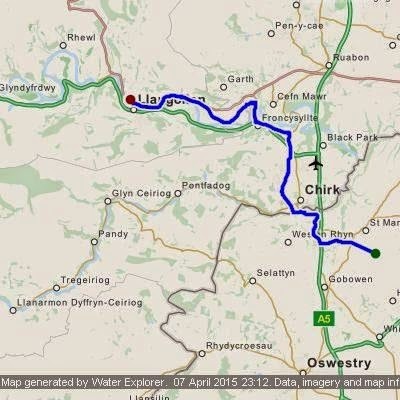 We carried on past Chirk itself, the marina, and then through Plas-yn-Pentre. A word of warning to the unaware. Great caution is needed as you proceed through this stretch of the canal as one is at great risk of being attacked and boarded by pirates hereabouts. Aaargh there be pirates..... but not today is seems. Luck was on our side and we escaped unharmed as the pirates must have been ashore having lunch with their mum at this point. Our next obstacle is a small lift bridge at Froncysyllte. By now we had quite a convoy of boats ahead and behind us as Mr Viking was going slower and slower but for an obvious reason. The boats ahead and behind him is are some of four coming towards us. Now I'm all for supporting commercial enterprise via boats on the canals but it was obvious he was hoping to capitalise on others misery by holding everyone up in the demented hope someone will by his wares. We had to squeeze into any space afforded as did others in our convoy so one by one boats heading towards us could get past. Working along was extremely tight so I did feel for the hirers whose novice helmsman skills were severely put to the test. Finally, once clear, we made it onto the Pontcysyllte aqueduct and were not disappointed. I had helmed across this back in 2002 so had to concentrate on steering. This time, however, Chris was determined to steer which left me free to enjoy the views as we crossed. I must say I'm proud that she braved taking the helm and did a great job too. Enjoying every minute at the helm. Once across I took the helm and made the tight left turn into the final leg of the canal toward LLangollen and beyond our last visit at Trevor. New waters for both AmyJo, and now us. We continued with great trepidation as we were informed 2 foot 3 inches was the maximum draft navigable on this stretch. So concerned were we AmyJo would be deeper that last night, using our boat pole, we measured AmyJo's draught to be sure. At 2 foot 4 inches (roughly) we knew it would be literally touch and go. Would we ground and if so would we survive the embarrassment? What if we got stuck and could not move. With fingers, toes and legs crossed we crept on gingerly praying the gods had us in their favour. Would we make it? At times there is only one way working with passing places on route so its vital to send someone on ahead. For us this was not necessary as Mr pathfinding Viking boat did the work for us. We simply followed behind. Here with the concrete banks and narrowness of the cut one could not help thinking we were on a giant theme park boat ride. Slow speeds and boats ahead and behind added to that feeling. That said the views one is presented with are breath taking making this one of the nicest stretches of the canal so far apart from the aqueducts of course. After 2 hours of slow cruising we finally made LLangollen Wharf and the Marina. We need not have worried about AmyJo's draught. Only once did we ground and then only lightly, but, as we could see the bottom it was clear we only just got through. Having made good time getting here we have a day or two in hand so decided to stay two nights to enable us to explore this lovely place. I did, however, make a bit of a school boy error mooring up. Can you see why from the photo above? You got it. The jetties are only 30 feet long so 37foot of AmyJo was sticking out beyond into the basin. Not normally a problem but when leaving AmyJo the only way to lock up and leave her is by the front doors. OOPs! Jenny and Robin - a couple of Kiwis from New Zealand. Looks like your having a great time and the weather been so good, happy cruising. We sure are, its so good to be out and about again. Hope all is well with your world. Hows life at the new Marina?